An ace closer joins Scott White's star-studded lists of busts for 2019, which is already headlined by big-name hurlers like Clayton Kershaw and Madison Bumgarner. A bust is basically any player who doesn't live up to his draft position, right? That's a generally accepted definition, anyway. But I feel like it's kind of warped one. "Bust" to me connotes a true bottoming out, a fall so cataclysmic that it could potentially wreck your season. So here in Busts 2.0, I'm redirecting the focus to those most at risk of disaster and leaving the simple cases of a player being overdrafted to my ADP review. For the most part, anyway. I still have to come up with enough names to populate an entire column, after all. Some of these names and arguments you may have caught at the end of January in Version 1.0, but the new ones all have the sort of disaster potential I'm referring to. Kenley Jansen's heart irregularity became the predominant storyline surrounding him last season, ultimately requiring offseason surgery, and it's certainly possible it impacted his performance. But if we put that big scary variable aside and assess him by what we actually can measure, he looks like a pitcher in sharp decline. First, there's the velocity, which did partly recover after barely brushing 90 mph at the start of the year and surely played a role in him salvaging his season after a disastrous April. But it didn't make it all the way back, and, it's worth noting, neither did Jansen, averaging 10.2 strikeouts per nine innings compared to 14.4 per nine in 2017. Sure, 10.2 K/9 is fine in a vacuum, but for a pitcher known for being a historically dominant closer, it's underwhelming and was also reflected in the swinging strike rate, which dipped about five percent. If a 1 mph difference in velocity (which is about what it ended up being) can make that much of a difference, imagine if his stuff continues to decline. Early radar readings have him in the high 80s this spring, which isn't a great sign. It'll get better from there, most likely, but will it get good enough to make him the pitcher he was from May through September? Because it looks to me like the line between that one and the one he was last April is razor thin. The case could be made that Mike Moustakas, a prolific fly-ball hitter who has spent most of his career in the wrong park for fly-ball hitters, is in line for career-best numbers now that he's in Milwaukee ... except that we already saw that movie for the final one-third of last season and he actually ended up with a worse slugging percentage and home run rate than with the Royals. OK, so no guarantees, but it was small sample, right? Here's the bigger problem: Any presumed improvements only matter to the extent he's capable of delivering on them, which is a fancy way of saying he needs to play. The Brewers signed him to play ... second base, that is — a position where he has yet to appear as professional, which includes his time in the minors, and one where it's hard to imagine him being halfway decent given that his range ratings the past two years at third base, a less range-dependent position, have left something to be desired. So yeah, maybe the Brewers will stick him at second base to start out, but do they keep him there from the seventh inning on? Do they start him six times a week? I have my doubts. Realistically, I see him getting no more than two-thirds of the workload there, and while he may steal occasional starts from Travis Shaw at third base, there's a reason the Brewers are flipping the scrip and playing Moustakas out of position this time. Quite simply, his bat is too valuable to remove as often as they had to down the stretch last year ... because he was playing second base. Makes you think. How desperate are we for stolen bases in Rotisserie and Head-to-Head categories leagues? Desperate enough that we're willing to target Amed Rosario about 170th overall, according to FantasyPros ADP. That has to be the reason, right? The guy stole 18 bases in the second half last year, so I guess we're hoping he can translate it to something like 40 over a full season. Wait, what? Billy Hamilton and his near-certain 50 stolen bases are going even later? OK, well, maybe it isn't a total steals play. But what else could it be? Middle infield isn't weak anymore, especially shortstop. Upside? It's mostly theoretical at this point. Yeah, Rosario hit .284 over the final two months last season, but with a suspicious .335 BABIP and an insignificant .731 OPS. Plus, his fly-ball rate actually cratered to below 25 percent during that time, so it's not like we should have great hopes of a power surge. This one looks like a classic case of putting the cart before the horse for a former top prospect. Yeah, he might contribute in stolen bases, but there's little evidence of him helping in any other way. And there are better ways of addressing a steals crisis. There's a path to the MVP-level production Javier Baez delivered in 2018 — we know because he took it — but it's a narrow one. I'm not even suggesting any one thing he did was entirely fluky or out of character, but to do them all again, all at once, is a fine line to walk. His approach is so undisciplined that he needs an outlier-type BABIP, like around .345, to make a positive impact in batting average. And while 2018 wasn't the first time he delivered one, living in that range is an unreasonable expectation for all but the best hitters in baseball. Besides, the last time he did it, he hit only .273 because — guess what? — Baez's 2018 also relied on outlier power production, his 24.3 percent home run-to-fly ball rate placing him eighth among qualifying batters. Maybe that's the new norm for him. Maybe he's one of the best in all the majors at maximizing fly-ball production, but again, it's asking a lot. He needs two superlative performances in two separate areas, and without one, it's a quick spiral from elite to ordinary. I'll borrow liberally from Dr. Mike Tanner of FanGraphs on this matter — him being a doctor and me not — and point out that lost time isn't the only effect of the balky back. Every time Kershaw pitches now, it's through injury, those DL stints only serving to manage it, and the body's way of protecting injuries is to limit the output of other muscles, a phenomenon known as pain inhibition. Kershaw himself may not be able to explain why his average fastball velocity dropped 2 mph last year, but Dr. Tanner can. And now Kershaw has a shoulder issue that figures to sideline him for the start of the season. Perfect. Our innings expectations should drop even more. Try as the Dodgers might to manage the injuries, it's only going to keep trending this way, and now that we're to the point where he's no longer striking out a batter per inning, things could unravel quickly. Time to face facts: Madison Bumgarner hasn't been the same since crashing his dirt bike early in 2017. Whether it was the damage he did to his shoulder that day or the ungodly number of innings heaped on his arm during the playoff runs of his youth, it's not getting any better. The velocity declined on his cutter again last year. His swinging-strike rate continues to plummet. His 7.6 strikeouts per nine innings last year not only represented his lowest rate since his age-20 season but would have put him in the lower third among qualifying pitchers, had he qualified. And it came with a career-worst walk rate. He just doesn't have the stuff he used to and is having to eke by without it, being spared in large part by a forgiving home park. Even if he's able to navigate it again in 2019, he won't be able to withstand much more skills erosion without the dam breaking. For about a four-month span in the middle of last season, Matt Carpenter's elite batted-ball profile — his line-drive, fly-ball and hard-contact rates all ranking among the best of the best — finally yielded the desired result, briefly catapulting him into the NL MVP discussion. But he's 33, so now what? His prime years have been defined by injury and disappointment, and assuming it's all behind him feels like a stubborn disregard of history. Shoot, 2018 itself ended with him batting .170 with an absurd number of strikeouts in September. Even if you're a data zealot who holds firm to the idea that conflicting numbers will eventually agree over time, no matter how long the time, the fact is he's running out of time, having now reached an age when injuries are to be expected and a skills decline could hit hard. Edwin Encarnacion's decline has so far been a gentle one, ensuring that no one who invests in him has been left high and dry even when he doesn't quite live up to the previous year's production. But it may all change in 2019. For the third straight year, his strikeout rate rose and his ISO dropped in 2018, both signs of a slowing bat. He had his lowest walk rate in seven years, a sign that pitchers no longer fear him as they used to, and he swung and missed more than ever before. At 36, he may still be able to eke out another year or two of this sort of production, but particularly in an environment where power is so easy to come by, he's verging on the reward no longer being worth the risk. Add that he's in a pitcher's park for the first time and with a rebuilding club that doesn't offer much else offensively, and I'm guessing the seven-year streak of 30-plus homers comes to an end, if nothing else. This pick is unusual in that Miguel Andujar's numbers seem pretty honest. He hardly strikes out and had a normal BABIP, so why wouldn't he do it again? It's more a matter of whether he'll get the chance, which sounds crazy after he nearly won Rookie of the Year and obviously had a positive impact on the lineup. But his defense ... oh dear. How bad is it? So bad that FanGraphs give him a minus-14 Def score, lowest among qualifying third basemen. The next lowest was minus-5. The Yankees have focused this offseason on bringing in infielders to fill in for Didi Gregorius, but Gregorius, who had Tommy John surgery in October, isn't going to miss more than half of 2019. And while Troy Tulowitzki probably doesn't deserve to play much these days, DJ LeMahieu certainly does. So when everybody's healthy, the Yankees will need to reassess whether Andujar's bat is really worth his glove. True, they could potentially play both Aaron Judge and Giancarlo Stanton in the outfield, freeing up DH for Andujar, or even move Luke Voit off first base, but there are no guarantees here. Shoot, it's no guarantee Andujar doesn't become part of some platoon before then, with the Yankees swapping out offense for defense as they see fit. An ill-timed slump or series of defensive miscues could be catastrophic for his playing time, so while I think Andujar is a perfectly fine option if he plays, I'd prefer to see him go to someone else on Draft Day. If we could trust that Mike Foltynewicz's 9.9 strikeouts per nine innings were legit, it'd be easier to trust in the rest. But he had a below-average swinging strike rate and is lacking a true swing-and-miss offering (not to mention anything resembling a changeup). He did a pretty good job of getting ahead of hitters but ultimately walked 3.3 per nine innings, so it's not like you can trust him to put the ball where he wants. And to top it off, he had the 10th-lowest home run-to-fly ball rate among qualifiers, which means he probably should have given up more home runs than he did. I just don't see it all coming together so perfectly again. His FIP suggests he should have had a 3.37 ERA, and his xFIP, which better accounts for the home run luck, suggests it should have been 3.77. And remember: That's assuming he maintains the same strikeout rate, which we've already deemed unlikely. Add the elbow soreness he has experienced this spring, and the risk-reward ratio doesn't add up for me. Between Ryan McMahon and Garrett Hampson, a bottleneck is already forming for Rockies infield prospects and can only get worse once Brendan Rodgers, Colton Welker and Tyler Nevin prove ready. So it's put up or shut up time for Ian Desmond, who's only still around because the Rockies were foolish enough to sign him to a big-money deal two years ago. He's not a complete zero to Fantasy owners given his willingness to run a bit, but only four of his 18 home runs came in the second half last year, a necessary correction given that he's the most extreme ground-ball hitter in the game today. If that willingness to steal bases proves to be all he has left at age 33, he's not long for this role, so I wouldn't target him with the expectation of another 20-20 campaign. Kyle Freeland had an astonishing 8.4 WAR last year, a mark that some Hall of Famers would be proud to call theirs, so in a way it feels reckless to dismiss him so, especially since nobody's exactly drafting him as an ace. But just because he scaled the statistical tight rope for all of 2018 doesn't mean he can do it again. Nothing about the performance made sense given that nothing in his profile stands out. He's a below-average strikeout pitcher and a below-average control pitcher. He's below-average at getting ahead of the count with no better than an average ground-ball rate. He was great at stranding runners, but was it skill or just the way things turned out? Given his home venue's history of punishing mistakes and eating pitchers like him for breakfast — or shoot, eating all pitchers for breakfast, apart from the odd Ubaldo Jimenez or German Marquez season — there's not a case I can see for giving him the benefit of the doubt. You watch: George Springer is sure to get drafted in the fourth round again. Why? He's a name brand, an early trophy from the Astros rebuild who hit 30 homers that one time. Yeah, once. It's not that he's bad. He scores a bunch of runs batting atop the Astros lineup and offers a pretty high floor now that the strikeouts are under control. But he's routinely drafted for a best-case scenario that he has only once achieved in five years and that's becoming even harder to project for him with the approach of his 30th birthday. We learned pretty early in his big-league career that Springer wouldn't be the base-stealer he was in the minors, which meant his power would have to carry him. But he puts the ball on the ground too often to tap into that power fully. He's not even hitting line drives, ranking third-worst among qualifiers in that category last year, alongside known batting average liabilities like Khris Davis, Carlos Santana and Brian Dozier. It's why I don't expect any better in 2019. He's exactly who his peripherals say he is, putting much closer to NIcholas Castellanos than Juan Soto in projected H2H production. Reason for removal: Turns out Springer is going in more like the fifth round in 12-team leagues, which may seem like parsing, but at that early stage of the draft, especially given the scarcity of high-end outfielders, it's enough of a difference to matter. 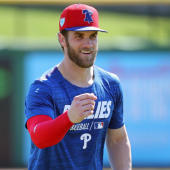 And if he lives up to his stated desire to run more, a skill he showed in the minors but never took with him to the majors, it raises his best-case scenario considerably. He lost 12 pounds this offseason in an effort to become more mobile and is already 3 for 3 on stolen base attempts this spring. The Mariners' decision to shed Nelson Cruz, Robinson Cano and Jean Segura this offseason leaves Mitch Haniger on Lonely Island, where he has to sustain himself during a period of non-contention, and it's not clear he's capable of doing that. Ask yourself: What is an outfielder who hits .285 with 26 homers worth in today's power-laden environment? What about if his .336 BABIP normalizes, leaving him with closer to a .260 batting average? Seems like he's verging on Hunter Renfroe's and Trey Mancini's domain in that scenario — i.e., nothing special. Certainly Haniger's production was special in 2018, but largely because of the 90 runs and 93 RBI, which were products of the supporting cast he no longer has. Without them, he's Joe Guy — maybe a little better in points leagues because of the walks, but certainly not worth the price of admission. Reason for removal: That price of admission isn't so bad, really — the same range as Nicholas Castellanos and Eddie Rosario. More to the point, though, I may have overstated the downside in my initial write-up. Yes, Cruz, Cano and Segura are all gone, but Edwin Encarnacion and Mallex Smith are now there, which at least replaces two-thirds of that equation. From the two hole, it's hard to imagine Haniger's run and RBI totals declining too terribly much. His own on-base skills should more or less take care of the former, and he figures to have speedsters Smith and Dee Gordon on base ahead of him. He'll be worse, probably, but the drop figures to be a subtle one. In fact, Peralta had the 21st-lowest fly-ball rate in all of baseball, which means if his quality of contact suffers, the correction could be steep. Continuing the power surge means asking him to do something better than almost every other player again. Seems unlikely, no? Reason for removal: Pointing out that Peralta is a long shot to live up to last year's power production is all well and good, but he's getting drafted at a place — Round 11 or 12 in 12-team leagues — where no one expects him to. And while it's possible he underwhelms even from that spot, the potential rewards of last year's numbers (which are clearly in the range of possible outcomes) balances it out. I end up turning to him as my third outfielder from time to time just because he's so plainly the best of the remaining options, and a player who finds himself in that spot doesn't deserve to be called a bust.